I do not scan, so I don't claim credit for it, I got the scans from Yamibo, so please do not ask me where i got my scans again. PLEASE. Click on the scans and a new window will open and bring you to the larger and clearer version. Please do not hotlink on forums, just paste my blog url and direct them to the Otome wa Boku ni Koishiteru Page section, thanks. 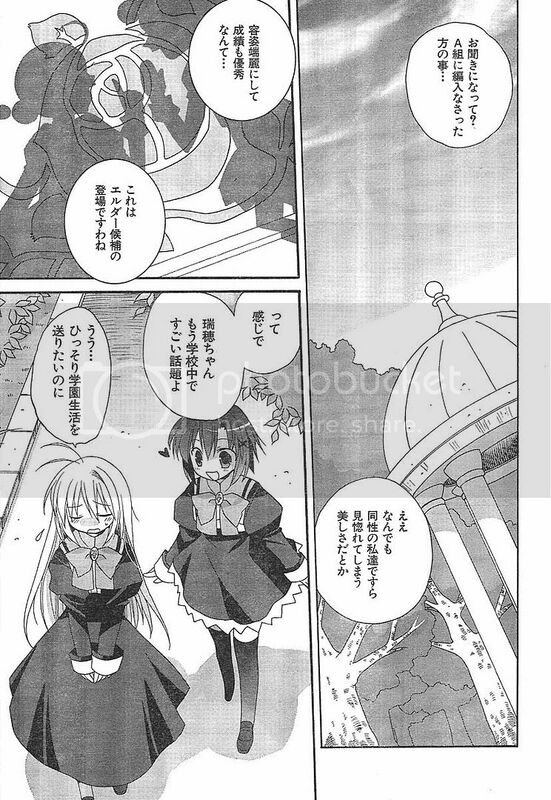 Alright, I don't have the translated version but looking from the pictures and stuff, it's pretty closely related to Otoboku Anime Episode 1. So read there for the summary haha. Okay okay, I'll vaguely describe some happenings in Chapter 1 later. The art style's kinda loli lol, not much fan service yet ... ah we managed to sneak peek Mizuho's bare chest though lol. I reckon Chapter 2 has more. 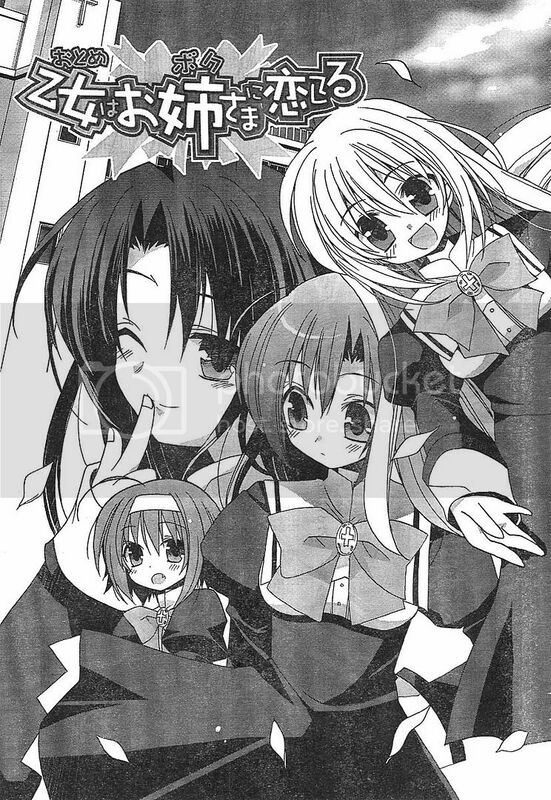 Oh, the manga's pretty new [Started on 21/09/2006] and on-going so recently as of now, there are only TWO chapters. Chapter 2's on Issue 12/2006 of Dengeki Daioh so if you got the moolah, buy it and scan it for us lol. Btw, the cover's page's Mizuho and Takako from Otoboku, more the reason to buy it! LoL. Skipping right to the part where Miyanokouji Mizuho [Note: A guy] was introduced to a class full of girls ... yes, he's been enrolled in a girls' school, Seiou Girls Academy. The girls immediately went gaga over him lol, praising his beauty, height and stuff. It was then explained that Mizuho's grandfather had left a will for him to attend Seiou. So currently, he's crossdressing as a girl to not blow his cover. The cafeteria’s overflowing with chatters about Mizuho, this was heard by the Student Council President, Itsukushima Takako. Some students probably started comparing her to Mizuho which made Takako a little pissed lol. After class, Mizuho's rushing to the dorm toilet because he couldn't find the courage to go in the girls' toilet lol. Running to the dorm, he noticed a long black-haired girl, Jyuujyou Shion standing serenely there and seemed spell bounded by her elegant. After that, Mizuho managed to dash and relieve himself in the dorm's toilet lol. Mariya chilled Mizuho for leaving the toilet seat up which might expose his secret. Mariya then introduced Mizuho to two juniors, Kamioka Yukari and Suouin Kana. Mariya then told Mizuho then Kana would be the junior responsible for serving him. [Similar to Strawberry Panic!, the lowerclassmen here serves the upperclassmen]. I'll update more details if the translated chapter is out. Oh, being the nice person, if you want the full RAW of C1, email yours truly with your subject, 'Otoboku Manga C1', if not I'll just take them as spam/junk mails. My email address is at the bottom of the blog. I'm doing this only for Chapter 1 and till end of October, I will not entertain future requests. I've updated the Strawberry Panic! 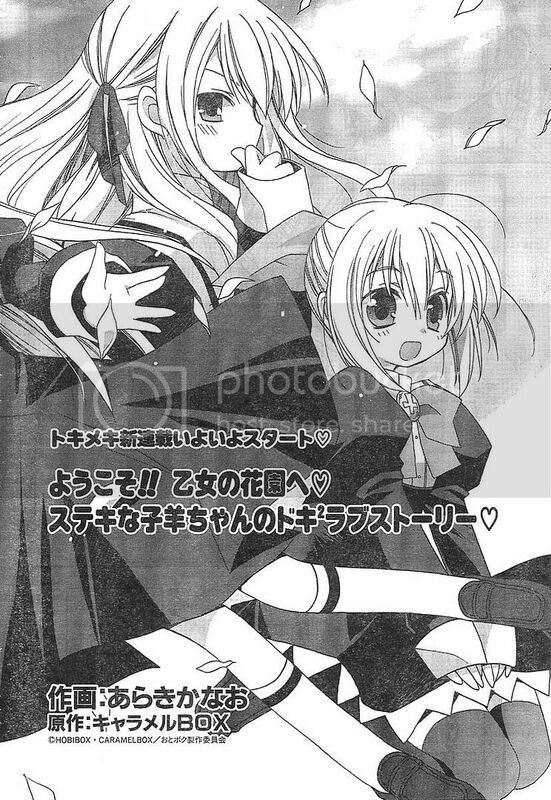 Magazine Scans Album, Strawberry Panic! 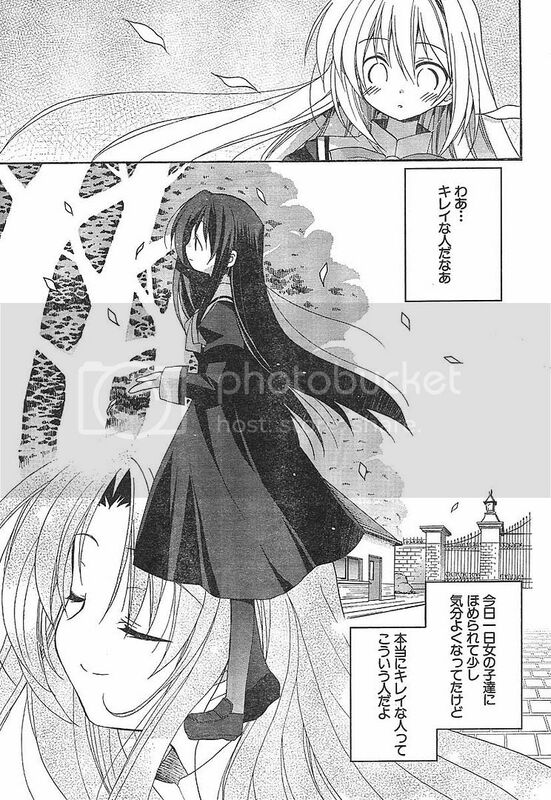 scans from issue 11/2006 of Dengeki G's. The password to the album's my nickname. As for review of Episode 3 of Otoboku, cya tomorrow =).